Iceskating fun for young and old. Discover IJsbaan Twente, together with your family. We are opened daily from 1th of October till April. Find current opening hours here. 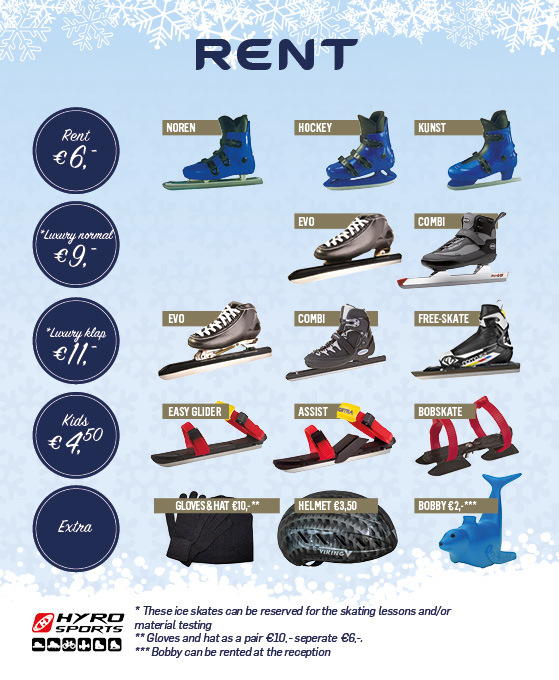 Our icerink has a 400 meter and a 30*60 meter track, a shop where you can rent iceskates and a cozy restaurant. * The price of a multiple visitcard is exclusive of €3,50 for the purchase of a customer card. The customer card can be topped up and will stay in your possession. Extra visits are valid until 1 year after purchase. ** A family pass allows entry for 4 persons (at least 2 children under the age of 15)..
*** A visitor doesn’t go ice skating. The visitorrate includes a cup of coffee, tea or hot chocolate in het Schaatscafé by showing the visitor card (this will be given to you at the reception). **** The schoolrate is only eligible during school hours and with the whole class present, under supervision of a teacher. The total amount must be paid at once. IJsbaan Twente offers various options for schools. School classes accompanied by a teacher can skate as a group. It’s possible to choose between free skating or skating lessons with trainer. Please contact us for booking a lesson or other informations. Email info@ijsbaan-twente.nl or call us at + 31 (0) 53 4601970. Our trainers speak English (not fluently).